While the period between August 2008 and August 2009 showed the most dramatic increase in viewing activity, it shouldn’t come as too much of a surprise. After all, Hulu was pretty new back then, as was Netflix’s streaming video service. As those services and others have grown in terms of content available and users tuning in, there was bound to be a sharp uptick in total number of streams. But the real interesting growth curve is the number of minutes spent watching those streams, which is increasing even faster. Part of that growth is coming from streaming becoming more mainstream as a way to watch on-demand and even live videos. But part is also coming from the influx of connected and mobile devices that are giving people access to streaming video on the big screen and on the go. 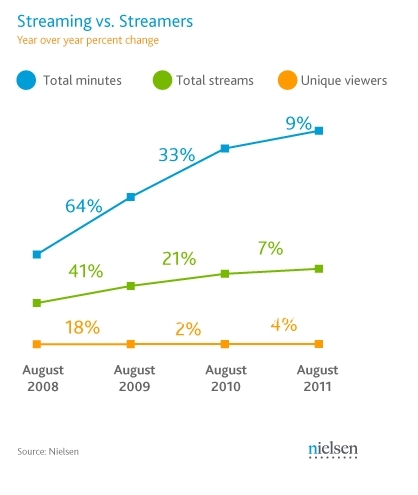 At what point will streaming video start to cut into more traditional TV viewing? Internet-delivered video has been seen as mostly complementary to traditional TV. As stats from Nielsen and others have shown, despite the increased adoption of streaming video, the amount of time people spend watching TV continues to grow. But at some point that might change — there are only so many hours in the day, after all. is anyone else totally flummoxed by that chart? Yes – it is one of the worst charts EVER! Nielsen should provide the data points to clarify, and send the offending analysts to an Edward Tufte course.